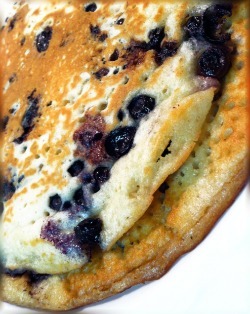 Gluten free blueberry pancake recipes can be just as tasty as "the standard" pancake recipe. And these blueberry pancake recipes are also vegan friendly. Gluten free pancake recipes are becoming very popular as more and more people find out just how "gluten Intolerant" they really are. A gluten free blueberry recipe is a great way to turn a pancake into a healthier meal as blueberries are loaded with antioxidants. And you can make an easy pancake recipe that only takes a few minutes to whip up. Using flax seeds or chia seeds soaked in water is a great way to replace eggs to hold a vegan blueberry pancake recipe together. Be creative and experiment when making your vegan blueberry pancake recipes. Try different flour combinations and even give sprouted flours a try. Combine the flax seed meal and water in a bowl - set aside to gel. In another bowl whisk together the dry ingredients. When enough time has passed stir the wet ingredients into the flax seed gel. Then mix together with the dry ingredients until a smooth consistency is reached. Fold in the blueberries. Pour 1/4 cup of batter onto a greased medium hot griddle and cook until the edges start to bubble ( about 2 minutes). Then flip pancakes and cook for another minute or until done. 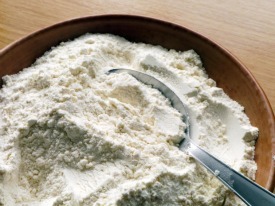 Sift dry ingredients together in a bowl. In a separate bowl combine wet ingredients. Add wet ingredients into dry ingredients (little at a time) until consistency is reached - add more vegan milk if needed. Ladle 1/4 cup of batter onto a medium-hot oiled griddle or non-stick pan. Cook for approx. 2 minutes before flipping pancakes. Cook for approx. 1 to 2 more minutes and place pancakes onto a plate. Garnish with fresh blueberries. Vegan milks can include coconut milk, almond milk, and hemp milk - which can all be made right in your kitchen. And mixing your pancake batter in a high speed blender can speed things up! Combine dry ingredients with wet ingredients. Blend ingredients together until a smooth consistency is reached, but not too thin or too thick. Heat up an oiled griddle or non-stick pan to a medium-high heat. Ladle desired portion of batter onto heated griddle or oiled pan. When bubbles start to appear and in approx. 2 to 3 minutes, it's time to flip the pancakes. Then cook pancakes for approx. 2 minutes longer - pancakes should be a golden brown color. Remove from heat and stack pancakes on a plate. Serve your pancakes with fresh blueberries and good quality maple syrup.